Center is a full congressional township, bounded on the north by Valley, east by Wright, south by Grove and west by Belknap and Carson townships. The main streams are Second, or Graybill, creek and Jordan. The earliest settlers who came were Joshua C. Layton, who arrived April 2, 1852; Reuben Maines came in 1855; Joseph Layton, Jacob Rust and Joseph Darnell in 1854; Louis Huff, Benjamin Palmer, Charles S. Robinson, Thomas Ephraim and Wm. McKee in 1856. Joshua C., or Captain Layton, as his friends called him, was born in Clark county, Ohio, August 27, 1807. The first justice of the peace in Center township was Jacob Rust. The first birth was in the family of Joseph Darnell and his wife and the child died. The first marriage was between James Morris and Lavinia Layton, daughter of Joshua C. Layton, on the first day of July, 1856. Mr. Layton was also the first assessor and made the assessment of the township in three clays. The first school was taught in a log cabin in the northeast quarter of section 7. This was in the winter of 1858-9 and taught by Martin Luther Ingoldsby. The first mill established in the township was on Jordan creek for grinding corn. It was simply a large coffee mill with a sack attached to receive the meal. Its capacity was about one bushel per day. It was run by a Mormon named Jordan, from whom the creek derived its name. In 1856 three brothers named McKee brought a portable sawmill into the settlement and afterward sold it to Joseph Layton and Joseph Darnell, who moved and set it up near the Botna bridge at Big Grove, and while in use the boiler burst and totally destroyed it. The first Fourth of July celebration ever held in this vicinity was in 1857 at a paper town laid out on the dividing line between Center and Valley townships and named Iola. This was on the faith of a railroad being built through here. The people came from all around and had a basket picnic, but the railroad failed to come that way and the three houses constituting the town were moved and Iola became a memory. and J. C. Layton was made its captain. Its first duty was to go under General Dodge to. the southern border to repel a threatened invasion of Iowa by Missouri rebels, but on arriving at the border they found the frontier already prepared for defense by volunteers from the border counties and accordingly returned to Council Bluffs, but were soon called upon to go to Sioux City, as the Indians were becoming troublesome on the northern frontier, but, after remaining there with a detachment of infantry and a battery of artillery and the Indians becoming quiet, the alarm subsided and the expedition again returned to the Bluffs and were disbanded. There was no more loyal community during the time that tried men's souls than that of Center township, of which Mr. Layton was an acknowledged leader and in recognition of which a township has been named in his honor. The people of this township have continued ever since to maintain their character as a progressive, upright and industrious community, and while it has no town of its own its interests seem identical with those of its next neighbor, Belknap. There are many names of the old pioneers that should be remembered, among which are -Jacob Rust, Joseph Darnell, Louis Huff, Benjamin Palmer, and the noble women who braved the hardships and privations that have resulted in transforming an uninhabited waste to one of the fairest spots on earth. The affairs of the township at the present time are entrusted to the following named officers: Trustees, G. W. Gage, T. R. Strong and W. Storts; clerk, George H. Nash; assessor, Paul Beezley; justices of the peace, Arthur Putnam; constable, Ashur Heckman. The following named persons constitute the school board: President, J. A. Goehring; secretary, F. D. Gould; treasurer, T. R. Strong. According to the state census of 1905 there were two hundred and eighteen persons of school age, of which one hundred and eight were males and one hundred and ten were females. Compensation of teachers is $40 and $35 for first and second class respectively. Garner township was settled by the Mormons at the same time that Kane, Rockford and Crescent were. What made this point particularly inviting was the abundance of timber for building their cabins and fuel, but even more was the little old Indian mill, which had been built by the government for the benefit of the Pottawattamies ten years before, and was run by S. E. Wicks. He was the last government agent to run it, and when that tribe removed the old mill was left and Mr. Wicks remained and became in full possession, making excellent flour to as late as 1860. He had married a squaw and they reared quite a large family, but they became scattered after the death of their parents. Among the first settlers were Wm. Garner, Adam Ritter, J. D. Haywood, in 1846, followed a little later by M. B. Follet, J. B. Dingman, George and Simeon Graybill, George Scofield, John Child, J. J. Johnson and Wm. Child. These all remained after the great body moved on to Utah and became some of the most prosperous farmers in the county, but, at this writing only one or two are living. The township is named in honor of the first named, who was known far and near as Uncle Billy Garner. He became wealthy, secured a large quantity of land mostly in the Mosquito valley, and as fast as one of his numerous family became of age or married, he would deed them land for a farm. Although of limited education his judgment in nearly all matters was considered infallible. This township is of irregular shape, a large piece king reserved by Kane from the southwest part, but this has been more than made up by a panhandle extending to the river along the south line of both Crescent and Hazel Dell, making the north line nine miles long, so that it is bounded on the north by Crescent and Hazel Dell, east by Hardin, south by Lewis and Kane, and west by Kal1e and the Missouri river. The principal streams besides the Missouri river are the Big and Little Mosquito and Indian creeks. It is strictly agricultural, there being no manufactories at present. Mr. Garner built a woolen factory many years ago, but it was abandoned after a trial of a few years. It is crossed by five railroads, the Rock Island and the Milwaukee passing diagonally through the center, and the Great Western cutting through the southeastern, while the Northwestern and also the Illinois Central pass through the panhandle on the extreme west. Probably half of it is timber land. Up to this writing, although a large and wealthy township, it has never had a railroad station or store. It had, however, for many years a large hall, built by the Grange, where meetings, both political and religious, were held, as well as elections, balls, and all kinds of social gatherings. Long before this was built, however, the little schoolhouse had crept into the edges of the groves and were used for social neighborhood meetings. In contemplating the habits of these early settlers, their industry, frugality and honesty, one is tempted to ask whether civilization may not be carried too far. If there was no church here, neither was there a saloon, and their wants were simple; their industry provided all of the substantials and from the moment of their coining their condition was being improved. The second mill built in the township was located about three miles above the Wicks mill on the same stream. It was erected by Wm. Garner in 1858, but after running a few years became unprofitable and was abandoned. army she conducted the farm, in addition to her manifold duties in the house, with almost masculine ability. While the man seems to be the subject of most history, there are thousands of noble, patient women that have been real helpmeets and contributed more than their half to the general welfare and there is something wrong that they fail to receive credit for it. The only way seems for them to become historians and speak for themselves, as we are so vain as to claim all the credit ourselves. The first school ever taught in Pottawattamie county is claimed to have been held in the little Mormon suburb of Kanesville called Carterville. This was in 1847. A Mr. Curtis was the teacher and he contracted to teach for $12 per month, but at close of school was compelled to compromise for a part. From this modest beginning the institution had grown by 1881 when the school enrollment reached three hundred, with twelve schoolhouses. At this writing (1907) the school board is organized as follows: F. S. Childs, president; B. G. Davis, secretary; and W. S. Clay, treasurer; with twelve subdistricts; with compensation, first-grade teachers $42.50, second grade $35, per month. According to the state census of 1905, there were four hundred and fifty-seven persons of school age. The vicinity of the old Wicks mill has for more than half a century played a conspicuous part in the early history of Pottawattamie county. It was here where the immigrants obtained their first flour and corn meal, and later, for many years, it was the place where the Latter Day Saints held their yearly meetings, some coming for nearly one hundred miles. A beautiful grove furnished an ideal camping ground, the Mosquito creek, like the Jordan, became famous for the number baptized in its waters, and alongside of the road coming from under a bluff was an excellent spring capable of supplying any number of worshippers. Nearby was a little schoolhouse where young Kinsman taught and from where he used to write interesting letters to the Nonpareil. Little did we think at that time of the noble part he was soon to play and the fame he was soon to achieve by his heroic death near Vicksburg. All honor to General Dodge and the others that assisted in recovering his remains and having a suitable monument erected to his memory. scour the brush around the city, but without success, and the very next day a Mr. Perks, while bringing in a load of wood, was halted on the hill in the southern part of the city and made to deliver. It will be remembered that the old Wicks mill had been replaced by a new one, built by George Parks and S. S. Bayliss, and was known as Parks' mill, and was operated by him, he going out mornings and returning evenings on horseback. The evening after the third robbery, on coming in as he came within fifteen or twenty rods of the spring by the roadside, a man rose from drinking and started on ahead. Mr. Parks was in the habit of carrying money for buying grain, and as a consequence always went armed, and seeing this man the conviction flashed upon him that this was the robber, and that he was making for a little thicket ahead, there to await him, and instantly resolved to take the initiative, and quietly riding up ordered him to throw up his hands and keep them there on pain of instant death for refusal. He then ordered him to walk by the side of his horse's right shoulder, keeping his bands over his head, until opposite the first house, being that of Mr. Vogle, whom he called to come out and disarm his prisoner. The weapons were two splendid revolvers, duly loaded and ready for use. Just then a team came along with several men and the man was brought into town where a committee was waiting to receive him. There being no jail at that time, he was taken to a room in the Hagg block, now known as the blue front, and the following day he was fully identified by his victims. The green goggles he wore when on duty were found in his pockets. Sheriff Voorhis requested someone to file information, but all refused, and the sheriff was calculating to get an order to commit him to the nearest jail; but the next morning he was found dead hanging to a willow tree in the yard where John Hammer kept his building material. It appeared that he was from Kansas and on hearing of his fate some one of his friends wrote to our mayor asking for particulars and saying he was not considered a bad man at home, and that he had been a soldier in the Union army. He was buried beside the other victims of vigilants on the ridge above the Soldiers' cemetery. But to return to Garner township. Another tragedy was enacted later wherein a young man named Charles Grainwell was killed by Thomas Davis. It occurred at a threshing. The young man was pitching the sheaves to Davis, who was feeding, and the sheaves coming too fast Davis became angry, and after some words Davis stabbed Grainwell with the big knife for cutting bands with fatal result. Davis was tried, convicted and sentenced to five years in the penitentiary, but after serving two years and a half was pardoned and left the country. Still later a Chautauqua assembly was established here and conducted for two or three seasons, but was not a success financially and was discontinued. The present township officers are as follows: Trustees, F. S. Childs, Fred Janson and G. W. Shipley; clerk, H. E. Tiarks; justices of the peace, Ed. Rozenberg and J. C. Begley. No constable seems to be needed, as none qualified after the last election. Grove township derives its name from the fact that it has a number of fine groves that if properly cared for will be sufficient for a dense population, arid what in the way of forest would have been considered indispensable fifty years ago would now be objectionable. It has been demonstrated that it is easier to make a farm from prairie and raise timber than to clear heavy .timber land and get it under cultivation. In Grove township we have a happy medium; enough but not a surplus. Grove township was included in Macedonia township until September 25, 1858, on which date, by authority of the county judge, the territory consisting of congressional township 74 north, of range 30 west, was declared a civil township, and the same was declared an election precinct, and it was ordered that an election be held therein on the second Tuesday in October, 1858. The election was held as ordered and the following persons elected: George B. Otto, township clerk; E. W. Knapp, justice of the peace; Cornelius Hurley, constable; David Watson, assessor; and Thomas Connor, A. J. Field and S. M. B. Wheeler, trustees. It is a full congressional township, and bounded on the north by Center, east by Waveland, west by Macedonia and Carson townships, and south by Montgomery county. It is watered by Jordan, Farm and Indian creeks, all flowing south, and are fed by springs that never dry. Long before this township had been organized or a permanent settler located trails were made by the Mormons while on their pilgrimage, and these became the roads of the pioneers that followed. In 1848 the following named men came in over the old Mormon trail from Illinois, viz. : James Watson, came with ox teams; George Owen, drove both horses and oxen; George Taylor, came with ox teams. These brought their families with them and were soon followed by many others. quarter of section 21, and for a time was used by the children of the entire township until 1868, when the township was divided into three subdistricts. From this modest beginning the schools continued to grow until, in 1881, when there were nine subdistricts with eight ungraded schools. Number of months taught, five and one-half; teachers employed, male five, female ten; compensation per month, males $30.86, females $29.70; pupils of school age, males one hundred and seventy-five, females one hundred and sixty. Many of these early settlers left Nauvoo intending to go to Utah, but for one reason or another they paused here and finally concluded to remain and few, if any, have had cause to regret it. The first to organize a religious body in the township were the Latter Day Saints. E. W. Briggs and W. W. Blair were the organizers, and the original members were John Smith and wife, E. W. Knapp and wife, A. J. Field and wife, James Otto and wife, Levi Graybill and wife, John Winegar and wife, Joseph Smith and wife, and Stephen Smith. John Smith was their first president and E. W. Knapp the first clerk. Services were first held at residences of the different members and later at schoolhouses, but the society becoming more numerous and wealthy, in 1874 they erected a modest church building at a c03tof $763. The membership had increased until in 1881 it had reached ninety and maintained a regular Sabbath school. The Wheeler's Grove class of the M. P. church was organized in 1865 by its original members, among whom were Isaac Denton and wife, Jacob Elsweck, Alexander Osler and Susan A. Stedman. In 1875 they erected a church building at a cost of $1,300, and by 1881 their membership was sixty and their Sunday school was thirty-five. Pleasant Grove congregation of the C. P. church was organized by the Rev. J. W. Carter July 1, 1876, was received under the care of the West Iowa Presbytery of the C. P. church August 18, 1876, with Rev. J. W. Carter the first pastor. In 1879 they erected a church building at a cost of $1,400. The Christian church was organized by Rev. Cephas Ellis and Samuel Johnson. Their first pastor was the Rev. Samuel Johnson. In 1881 they commenced building a church at a cost of $1,200. They had at that time a Sunday school of sixty pupils. The village of Eminence was laid out in 1875 by L.D. 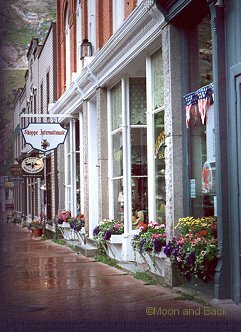 Woodmansie, who also was the first resident and also the postmaster, and in addition started a general merchandising business. And the next to locate was Dr. A. J. Michael, and he was followed by Malcom McKenzie, a blacksmith, and next came J. L. Harrell. He engaged in the manufacture and sale of harness, and later a general store was opened by F. E. and N. Pershall, brothers. September 30, 1863, Mrs. Isaac Denton gave birth to boy triplets, which were named, William, Wallace and Willard. They lived but a short time. On August, 17, 1864, the same lady gave birth to twins, but they lived but four and six hours respectively. destructive force on the devoted heads of the people of this township in which in less time than it takes to record it an entire family was killed and thousands of dollars' worth of property was destroyed. The details have been given by the press and are too well remembered by the citizens to require repetition, but simply to say that strong well built houses and barns were reduced to kindling, farming implements and domestic animals blown out of sight, even fowls stripped of their feathers in an instant. The saddest feature was the instantaneous killing of the family of Mr. Osler, Mrs. Paist and son. Long since the damage, so far as money value is concerned, has been repaired, but the loss of the friends who perished cannot be forgotten. According to the state census of 1905 there were in the township two hundred and forty-two persons of school age, of which one hundred and twenty-nine were males and one hundred and thirteen females. The school board is constituted as follows: President, James K. Osler; secretary, John A. Knox; treasurer, G. M. Putnam. Teachers' salary, $38 and $33. The township officers are as follows: Trustees, L. A. King, J. A. Mitchell and A. C. Bissbe; clerk, Thomas Morgan; justices of the peace, Harvey Bolton and E. V. Winans; assessor, John A. Knox. No one qualified as constable. Mention has already been made of the division of Crescent township by which Hazel Dell was formed. It is a full congressional township. It lies mostly on high rolling upland, sloping easterly toward Mosquito and westerly towards Pigeon creeks. There are fine groves of timber in the ravines and the soil is as good as any in the world. Most of the first settlers were Mormons, but the larger part went on with the great movement to Utah. The first officers of the new township were: J. P. Boulden and James Osborn, trustees. Nearly all the early history of this township is identical with that of Crescent, but it has become famous as being the birthplace of Indian creek. This is probably the most active stream on earth of its size. It rises in some springs near Hazel Dell church, drains twenty square miles before reaching the city, when it has to be spanned by as many bridges. Engineers have grappled with it for forty years and it seems to relish the fun. It has not been an unmixed evil though, for it has been bringing down millions of yards of earth to fill the low ground at the foot of the bluffs without which the beautiful ground where Bayliss park, the courthouse, library and much of the best property in the city, would new be a morass like it is a mile either way from these points. We will probably hear more of this stream in connection with the city of Council Bluffs. lets, Springers, Osborns, McGruders, Frosts, Jenkins and many more of the same sort; one would think they might be exempt from most of the troubles with which other communities are afflicted, but it seems that the evil one had long ago invaded a much happier though smaller one, and so this township, like most others in the county, must have its tragedies. On the 26th of February, 1878, in the northwest corner of the township, the people were shocked by the killing of David Roberts by Jonathan J ones. After a long and tedious trial Jones was acquitted on the plea of emotional insanity caused by jealousy. A long time previous to this an affair was pulled off that partook of the nature of melodrama. There was a "fine old English gentleman" who was a widower, had a farm in one of the beautiful dells, and a fine trotting horse named Charley, of which he was very fond. He dressed well, was seventy, and still was not happy. He longed for a companion, and he found one about half his age, and all for a time went well. He was wont to extol her many virtues to his friends in town when he met them. In fact he found her superior to either of his former wives (this was the third) and one fine morning he started to go to look at some land at quite a distance, but promised to return for supper, and she kissed him good-bye and put her arms around Charley's glossy neck and kissed him. Someone once said "Frailty, thy name is woman!" When that old gentleman returned he found his house a desolation! The finest of the bedding, all of the silver, china and glassware that had been his former wife's, had disappeared as effectually as if the earth had opened and swallowed them up. All his efforts to locate her were fruitless, but after some weeks it was reported she was half way to Salt Lake with a younger man and former lover. Another tragedy occurred more recently in the extreme southeastern part of the township. It appeared that a store at Weston had been robbed. Deputy-sheriff J. C. Baker was investigating the matter, and on questioning a young man named George Matheson pretty closely, he became indignant and shot Baker. He was indicted and tried for assault with intent to commit murder and found guilty, but appealed and cause was sent back on error in ruling. On rehearing he was convicted of assault with intent to inflict great bodily injury. In a civil action Baker recovered a heavy judgment. It seems but proper to make special mention of old Mrs. Nixon, the Spartan mother long since deceased, that sent three sons and three sons-in-law to the Union army. During the winter of 1855-56 an old settler, Mr. Barrett, father of O. L. Barrett, superintendent of the county infirmary, became lost and was frozen to death, but his widow conducted the farm and reared the family. At this time the people of Hazel Dell will compare favorably with those of any township in the county. three hundred and eighty-two of school age in the township, one hundred and ninety-three males and one hundred and eighty-nine females in eight subdistricts. This township is only touched by railroads on the extreme southeast corner, where the Rock Island and Milwaukee running parallel strike the village of Weston. This place has an elevator, lumber yard, general store, one church (Catholic) and a graded school. The teachers receive $40 and $35 respectively for first and second grades. Mr. Jacob Hansen is entitled to special mention, having served the public faithfully as supervisor and later on the joint commission of Harrison and Pottawattamie counties to assess the benefits to the land owners by reason of the construction of the several ditches petitioned for and granted by the joint boards of said counties. Hardin township was organized in 1869. Previous to this it was a part of Kane. It is a full congressional township, and is mostly high rolling prairie but has some groves of natural timber. This township is named in honor of Richard Hardin. He came to Council Bluffs with his father, Davis Hardin and family, in 1838 when a boy. That being the first white family this far up the Missouri. The Hardins were typical Kentuckians. Tall, heavy boned, fond of hunting, generous and liberal in all their views. Davis, the father was sent to take charge of the Pottawattamies, as will be more fully treated in the part of this history pertaining to Council Bluffs. Keg creek, Little Keg and Little Silver creeks are the principal streams, and the township is watered by springs. The first permanent settler was Mr. Reece D. Price, who came from Wales in 1849 and settled with a number of Mormon families. There were one cluster of thirteen log huts in one camp and another of eleven. In the summer of 1850 these went on to Utah and left the family of Mr. Price entirely alone. The rich lands, of which none are better, soon attracted settlers, and by 1858 quite a number of first-class citizen, had located here. Among them were Mrs. Perry and family, R. C. Thomas and family and Mr. W. K. Eames from Vermont, in 1857, and from this time on they continued to arrive, and soon a school was started. The first ever taught in the township was by Mr. -Lorenzo Burr in 1857. He was employed by Mr. Reece D. Price, and the school was in a log cabin belonging to him. The first bridges built were over Keg creek at the Hardin stage station and Weasel Run. Both are built of logs. The first road was the old stage road, running from Des Moines to Council Bluffs, and the Western Stage Co. did a great business until the coming of the railroads. The Methodists organized a little society as early as 1880, also quite a large Sunday school. The first schoolhouse built by the township was on section 18, near the residence of Mr. James Wild. The first to teach in the new building was an English priest by the name of Middleton. " seven. Salary per month, both sexes, $30; number of pupils, males, one hundred and two, females, eighty-two. Schoolhouses, frame, four; brick, one; value $1,500. Since 1881 these have increased to nine in 1905 with three hundred and six persons, including those of the new town of McClelland, between the ages of five and twenty-one years. The Chicago & Great Western Railroad is the only one that passes through this township. It was completed in 1903, and immediately the new town of McClelland sprang into existence and at this writing there are a lumber yard, depot buildings, three general stores, one drug store, one implement and hardware store, two saloons, a livery stable and blacksmith shop and one elevator. The Methodists have organized a church and erected a neat house of worship. Mr. Pete Cramer is engaged in buying and shipping stock. The county infirmary is also located here under the superintendance of O. L. Barrett. Among those who, by industry and integrity, have made themselves prominent are D. F. Dryden and Elias Quick, the former being a farmer and large stock raiser. He was for a time a member of the board of supervisors, and is an ex-soldier of the civil war. The latter started a store in 1883, and a postoffice was established at his store in 1884, and named Quick postoffice. Few merchants have been as fortunate as he. Starting in with a moderate stock, everyone of the twenty-three years showed an increase in his business and profits. This was due largely to his strict attention to business and partly from the fact that no better class of people can be found than those with which he is surrounded, and both these gentlemen have become wealthy and built elegant homes in the city, where they now make their homes, letting their boys continue the business. Mount Hope, the other being Presbyterian. A Masonic lodge and Eastern Star were organized simultaneously in 1900, and a lodge of Modern Brotherhood in 1898, also a lodge of Modern Woodmen at Armour Grange in 1904. No community, however well ordered, seems to be exempt from trouble. It appears that a young man named John Emerine had married a daughter of Mr. W. K. Eames. Emerine became so dissipated that his wife obtained a divorce and returned to her father's home. They had one child and Emerine would insist on coming to see the child, and on being ordered away by the father, shot him but only wounded him slightly. On coming again young Eames shot him, only wounding him, after which he left, and was gone some time and again returned, and being seen around the premises a younger son of Mr. Eames shot him again, this time proving fatal. There was no indictment. The present township officers are: J. M. Underwood, Eugene Steepfell and F. B. Chambers, township trustees and M. W. Davis, clerk; A. F. Mammen and A. K. Chambers, justices of the peace; J. O. Chambers, constable and H. R. Smith, assessor. The present board of education is composed as follows: President, J. W. Wild; secretary, J. A. Price; treasurer, George Quick.